One of the most popular questions I am asked, is how to get from Piraeus to Athens. This is because the Piraeus ferry port is a major transport hub. People arrive by cruise ship to Athens here, and most Greek island hopping adventures also start and end at Piraeus. This guide lays out all the options to get from Piraeus port to Athens, using taxi, bus, and train. Arriving at Piraeus ferry port can be a confusing experience, even for locals! As the ships dock and let off their passengers, a sea of people and suitcases froth uncontrollably. Each person is on their own mission, whether it is to catch another ferry to a Greek island, travel from Piraeus to Athens centre, or catch a taxi from Piraeus Port to Athens Airport. But don't panic! 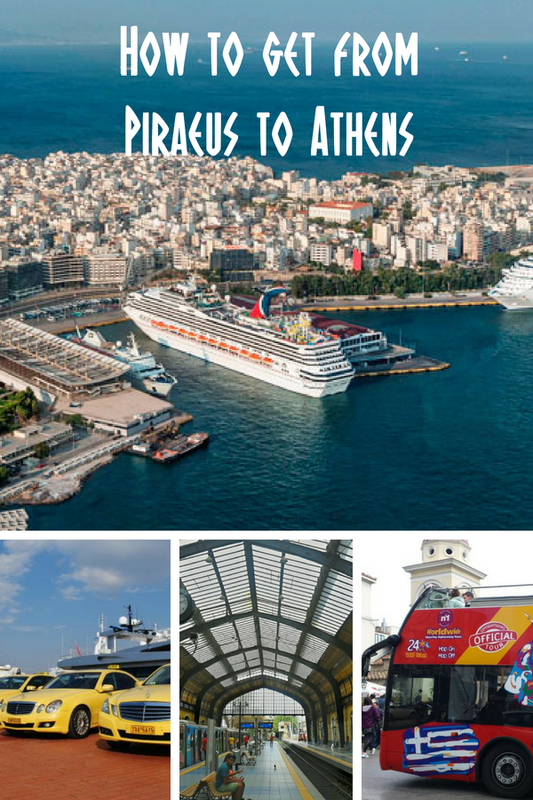 This guide has been written so that you know all the Piraeus transfer options before you go. I've broken this travel guide into two main sections to make life easier. These are getting from the port to the centre, and getting from the port to Athens airport. Over the years, I have realised that people who want to travel from Piraeus to central Athens fall into two broad categories. 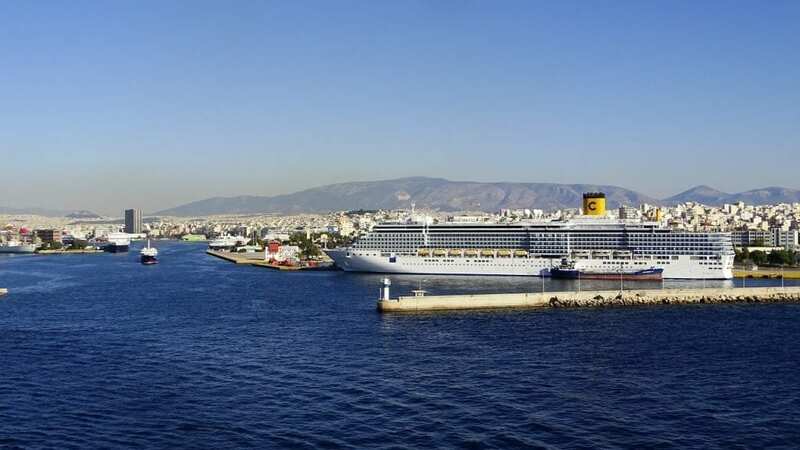 The first, are those visiting Athens on a cruise, who may spend just one or two days sightseeing in Athens before returning to their cruise ship. The second, are people who have finished their Greek island hopping adventures, and now want to spend a couple of days in Athens. As such, I've listed every conceivable transport option on getting from Piraeus harbour to Athens. If time is limited or you can't be bothered with the hassle of joining long queues to wait for a taxi, a prepaid taxi is a great option. I personally recommend Welcome Pickups, as they have English speaking drivers, can provide extras such as SIM cards and maps, and meet you at the ferry gate in Piraeus holding up your name. Best of all? The price is the same as if you take a taxi from the line. Journey time – Approx 20-25 minutes in a taxi from Piraeus to Athens centre. There are many taxi ranks at Piraeus Port and cruise terminals, with easily identifiable cars waiting to take passengers to their destinations in Athens. The Athens taxis are all yellow with a black and yellow sign on the roof. Beware anyone walking up to you asking if you want a taxi – these may be unlicensed! Instead, head straight to the queues. The one downside of getting a taxi from the lines at Piraeus, is that hundreds of other passengers that have arrived with you on the ship will all have the same idea! If your ship arrives at Piraeus at a busy time, be prepared to wait! The metro is a convenient method of getting from the port at Piraeus to the centre of Athens. The one downside, is that it can be a ten minute walk from your ferry gate to the metro station itself. If you're cool with this though, you'll find the price very nice at currently 1.40€ a ticket, which lasts for a total of 90 minutes on the metro system. You will be going into Athens from Piraeus on the green line, and unless you need to stop earlier, you would probably get off at Monastiraki. From here, you have the choice to walk to your hotel if it is nearby, or switch lines to the blue line to get off at Syntagma Station which is the very heart of Athens city centre. Another option is to carry on from Piraeus through to Omonia, swap onto the red line, and then take the metro to the Acropolis station. If you are staying at a hotel near the Acropolis, this is where you would need to get off from. Journey time – Approx 30 minutes depending on where you need to change lines. There are dozens of buses from Piraeus to different parts of Athens, but only two main ones apply for people travelling from the port into the centre of the city. These are the X80 bus and the 040 bus. The X80 bus is probably the most convenient with people looking for easy connections between Piraeus and Athens centre. Leaving the Piraeus cruise terminal, it has stops at Akropolis and Syntagma Square, although the service only runs between 07.00 and 21.30. Just ask anyone at the port where the bus stop is, and they will point the way. The cost is around 4.50 euros per ticket, and it could be classed as a ‘tourist bus' – you are more likely to get a seat on this one! The 040 bus from Piraeus into the centre of Athens runs 24 hours, and tickets are price at 1.40 Euros. The chances of getting a seat on this bus are going to be slim if you are travelling when everyone else does! Prepare for a bit of a scrum, and if you are a family, keep together! If you have arrived at Piraeus port on a cruise ship, there is a possibility that a shuttle bus is included in your ticket. Check with your service provider for more details, or ask whilst you are on-board. This can be a very easy way of getting into the centre of Athens from the ferry port at Piraeus. You will need to make sure when and where the Piraeus shuttle bus takes you back to the port though! 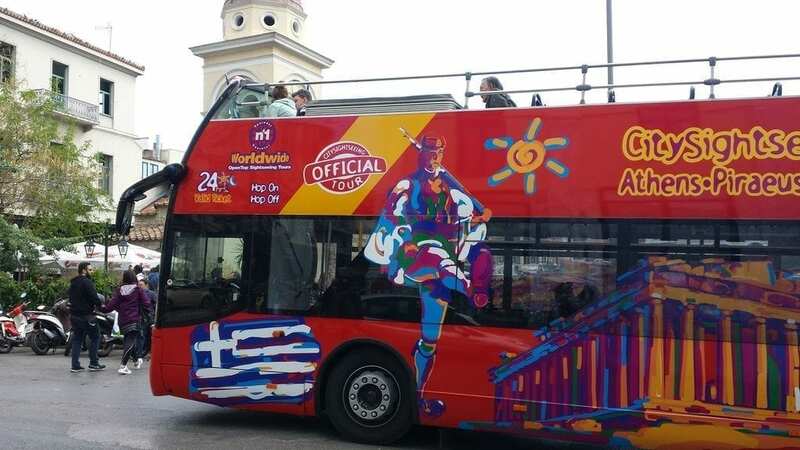 Another interesting option for people arriving on a cruise and spending just a day in Athens, is to check out the Athens Hop On Hop Off bus. Generally speaking, I don't normally recommend this for people visiting Athens as it is a really easy city to get around. For people arriving at Piraeus port with limited time though, it could be ideal. You get the opportunity to stop off at the most significant sites in Athens, have your transport taken care of, and even get some commentary! Journey time – As long as you need it for! If you've finished your cruise or Greek island hopping experience and it's time to fly home straight away, you'll need to get from Piraeus to Athens airport. There are several options available, and I've listed them below. If you have to get straight to Athens airport from Piraeus, then a prepaid taxi may be your best option. This way, you have no waiting and no delays. Your driver waits to greet you, you get straight in the taxi, and then it's off to the airport! Again, I'd recommend Welcome Pickups for this service. You can find out more here about a prepaid taxi from Piraeus to Athens Airport – Piraeus Athens Airport Taxi. Journey time – Approx 40 minutes depending on traffic. Taking a taxi from Piraeus to Athens airport is the same as if you want to get into the city centre. Simply join one of the taxi rank queues, and a licensed taxi driver will take you there. Flat rate fares should be in operation, and at the time of writing this was 54 euros during the day, and 70 Euros at night. 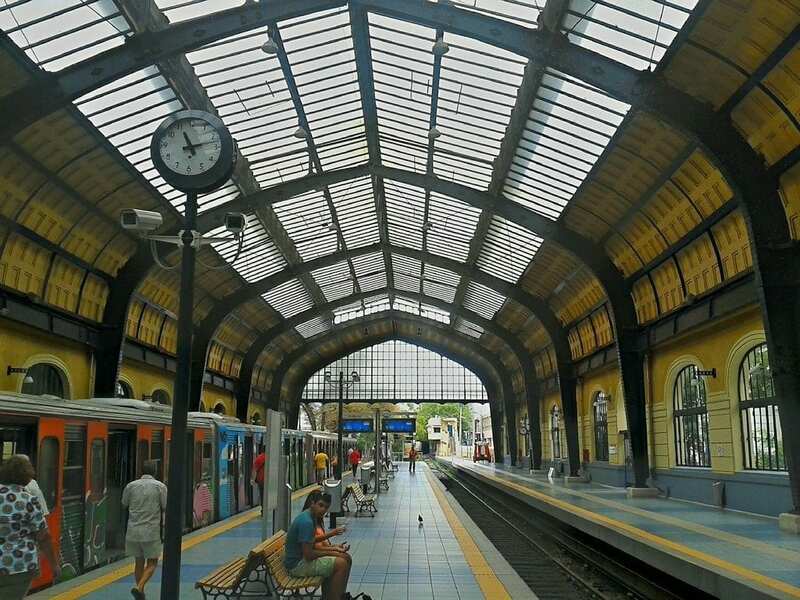 Taking the metro from the ferry port at Piraeus through to the Athens airport terminals will follow the same procedure as getting into the centre of the city, along with a change of line. Take the metro through the Monastiraki, and then swap lines to take the metro on to the airport. Keep an eye on your bags, especially on the change over between platforms. Journey time – Approx 60 minutes depending on traffic. A new suburban railway service now connects Athens airport and Piraeus port. At Piraeus the railway station is next to the metro station. You can ask anyone to point the way. From here, you can take a train which terminates at the airport. Journey time – Approx 60 minutes. The X96 bus from Piraeus to Athens Airport is a direct service that runs 24 hours. The price for the bus is around 5 euros, and the journey time is 90 minutes. If you get a seat when you get on the X96 bus, then the journey is reasonable. If you have to stand all the way… well, better not think about it! In a rush to get to the airport from Piraeus? You might want to avoid it. Journey time – Approx 90 minutes depending on traffic. If the Piraeus travel guide above doesn't have enough information for you, I've also answered a few FAQ below! 1. How far is Piraeus from Athens? The approximate distance from the centre of Athens to Piraeus is 15 kms. 2. How far is Piraeus from Athens Airport? The approximate distance is 45 kilometres to Athens airport from Piraeus. Due to the route that has to be taken, the journey can be around 50 minutes in light traffic – sometimes longer. 3. How much is a taxi from Piraeus Port to Athens centre? The price for a taxi from the cruise terminal at Piraeus to the centre of Athens should be around 25 Euro. 4. How much is the bus from Piraeus Port to city centre? Depending on which bus you take, the bus from Piraeus to the city centre of Athens is 1.40 Euros or 4.50 Euros for the express bus. 5. How much is the metro from Piraeus cruise terminal to Athens? The fare is 1.40 Euros, and the ticket is valid for 90 minutes. You are also allowed to swap lines during this time. Does the 80x run in november. thanks Harold. The X80 is a seasonal bus, but the finish times have not yet been released. Last year, it ran for the first two weeks of November. This year… it’s unclear so far. Thanks, Harold. If any more information near the time it would be very helpfull.